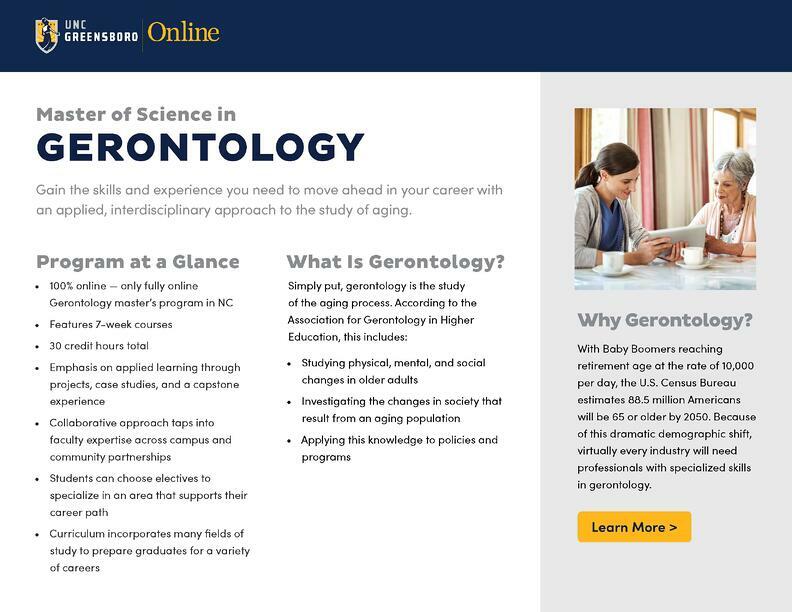 UNCG’s online Master of Science in Gerontology takes an applied, interdisciplinary approach to the study of aging. The program’s mission is to teach, research, and apply knowledge through collaborative relationships with academic departments, community organizations, and businesses to enrich the lives of older adults and their families. Students in the program come from a variety of academic backgrounds. Graduates pursue careers based on their interests, working directly with older adults or on their behalf. Ready for a closer look at the online Master of Science in Gerontology? Our brochure provides complete program details, admission deadlines, start dates and graduation requirements.